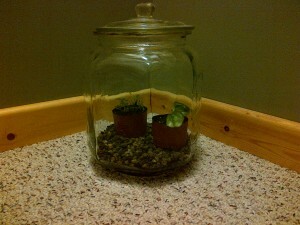 The old terrarium was doing ok but it just seemed like it needed some sprucing up. So I thought I would try putting the plants in tiny pots for a nice clean look. I removed all the soil and put a bit of gravel in the bottom to create a smooth layer. I then got some cheap plastic pots and cut them short so they aren’t as high. I think I might get some nicer ceramic ones in future. There is a Moon Valley Pilea (I think) and a Peperomia in there. These guys seem to do ok in the terrarium. I’m still learning which plants are good for terrariums. This was written by Rob Carrelli. Posted on Sunday, December 14, 2014, at 7:03 pm. Filed under garden. Bookmark the permalink. Follow comments here with the RSS feed. Trackbacks are closed, but you can post a comment.